Local anesthetics provide a reversible regional loss of sensation. Local anesthetics reduce pain, thereby facilitating surgical procedures. Delivery techniques broaden the clinical applicability of local anesthetics. These techniques include topical anesthesia, infiltrative anesthesia, ring blocks, and peripheral nerve blocks (see the Technique section below for links to detailed, illustrated articles demonstrating these techniques). Local anesthetics are safer than general or systemic anesthetics; therefore, they are used whenever possible. In addition, they are relatively easy to administer and readily available. Local anesthetics have been undergoing development for centuries, and, as this article illustrates, research continues to provide surgeons with pharmacologic variety and to provide patients with anesthetic agents that have superior safety and efficacy profiles. Although the medical world cannot cure every disease, the control of pain to ensure patient comfort should be a goal. In 1860, cocaine, the oldest anesthetic, was extracted from the leaves of the Erythroxylon coca bush. In 1884, Sigmund Freud and Karl Koller were the first to use it as an anesthetic agent during ophthalmologic procedures. Procaine, a synthetic alternative to cocaine, was not developed until 1904. Procaine is an ester of para-aminobenzoic acid (PABA). As procaine is metabolized, PABA, a known allergen, is released as a metabolic product. The potential for severe allergic reactions limits the use of procaine and other ester-type anesthetic agents. Tetracaine, another ester-type anesthetic, was introduced in 1930. Tetracaine is more potent than procaine, and it causes similar allergic reactions. In 1943, an alternative class of anesthetics was discovered when Lofgren developed lidocaine. This agent is an amide derivative of diethylaminoacetic acid, not PABA; therefore, it has the benefit of a low allergic potential. Since then, multiple amide-type anesthetics have been introduced into clinical use. Slight chemical alterations to the compounds have imparted beneficial characteristics, including increased duration and potency, to each. These compounds offer the surgeon more choices, and anesthetics can be appropriately matched to different procedures. Reviewing the physiology of nerve conduction is important before any discussion of local anesthetics. Nerves transmit sensation as a result of the propagation of electrical impulses; this propagation is accomplished by alternating the ion gradient across the nerve cell wall, or axolemma. In the normal resting state, the nerve has a negative membrane potential of -70 mV. This resting potential is determined by the concentration gradients of 2 major ions, Na+ and K+, and the relative membrane permeability to these ions (also known as leak currents). The concentration gradients are maintained by the sodium/potassium ATP pump (in an energy-dependent process) that transports sodium ions out of the cell and potassium ions into the cell. This active transport creates a concentration gradient that favors the extracellular diffusion of potassium ions. In addition, because the nerve membrane is permeable to potassium ions and impermeable to sodium ions, 95% of the ionic leak in excitable cells is caused by K+ ions in the form of an outward flux, accounting for the negative resting potential. The recently identified 2-pore domain potassium (K2P) channels are believed to be responsible for leak K+ currents. When a nerve is stimulated, depolarization of the nerve occurs, and impulse propagation progresses. Initially, sodium ions gradually enter the cell through the nerve cell membrane. The entry of sodium ions causes the transmembrane electric potential to increase from the resting potential. Once the potential reaches a threshold level of approximately -55 mV, a rapid influx of sodium ions ensues. Sodium channels in the membrane become activated, and sodium ion permeability increases; the nerve membrane is depolarized to a level of +35 mV or more. Once membrane depolarization is complete, the membrane becomes impermeable to sodium ions again, and the conductance of potassium ions into the cell increases. The process restores the excess of intracellular potassium and extracellular sodium and reinstates the negative resting membrane potential. Alterations in the nerve cell membrane potential are termed the action potential. Leak currents are present through all the phases of the action potential, including setting of the resting membrane potential and repolarization. Local anesthetics inhibit depolarization of the nerve membrane by interfering with both Na+ and K+ currents. The action potential is not propagated because the threshold level is never attained. Although the exact mechanism by which local anesthetics retard the influx of sodium ions into the cell is unknown, 2 theories have been proposed. The membrane expansion theory postulates that the local anesthetic is absorbed into the cell membrane, expanding the membrane and leading to narrowing of the sodium channels. This hypothesis has largely given way to the specific receptor theory. This theory proposes that the local anesthetic diffuses across the cell membrane and binds to a specific receptor at the opening of the voltage-gated sodium channel. The local anesthetic affinity to the voltage-gated Na+ channel increases markedly with the excitation rate of the neuron. This binding leads to alterations in the structure or function of the channel and inhibits sodium ion movement. Blockade of leak K+ currents by local anesthetics is now also believed to contribute to conduction block by reducing the ability of the channels to set the membrane potential. On the basis of their diameter, nerve fibers are categorized into 3 types. Type A fibers are the largest and are responsible for conducting pressure and motor sensations. Type B fibers are myelinated and moderate in size. Type C fibers, which transmit pain and temperature sensations, are small and unmyelinated. As a result, anesthetics block type C fibers more easily than they do type A fibers. Therefore, patients who have blocked pain sensation still feel pressure and have mobility because of the unblocked type A fibers. All local anesthetics have a similar chemical structure, which consists of 3 components: an aromatic portion, an intermediate chain, and an amine group (see molecular diagram below). The aromatic portion, usually composed of a benzene ring, is lipophilic, whereas the amine portion of the anesthetic is responsible for its hydrophilic properties. The degree of lipid solubility of each anesthetic is an important property because its lipid solubility enables its diffusion through the highly lipophilic nerve membrane. The extent of an anesthetic's lipophilicity is directly related to its potency. Local anesthetics are weak bases that require the addition of hydrochloride salt to be water soluble and therefore injectable. Salt equilibrates between an ionized form and a nonionized form in aqueous solution. Equilibration is crucial because, although the ionized form is injectable, the nonionized base has the lipophilic properties responsible for its diffusion into the nerve cell membrane. The duration of action of an anesthetic or the period during which it remains effective is determined by its protein-binding activity, because the anesthetic receptors along the nerve cell membrane are proteins. 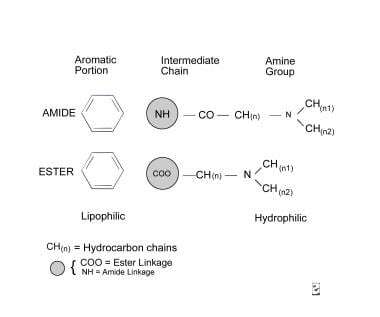 The intermediate chain, which connects the aromatic and amine portions, is composed of either an ester or an amide linkage (see molecular diagram above). This intermediate chain can be used in classifying local anesthetics. Anesthesia is indicated to reduce pain before surgical procedures. Patient allergies may preclude the use of a particular anesthetic agent (see Complications section below). Local anesthetics are classified into 2 groups: the ester group and the amide group. The classification is based on the chemical structure of the intermediate chain. This structural difference affects the pathway by which local anesthetics are metabolized and the allergic potential. Ester anesthetics are listed in the Table below. They are metabolized by hydrolysis, which depends on the plasma enzyme pseudocholinesterase. Some patients have a rare genetic defect in the structure of this enzyme and may be unable to metabolize ester-type anesthetics; this inability increases the possibility of their having toxic reactions and elevated levels of anesthetics in the blood. In addition, 1 of the metabolic products generated by hydrolysis is PABA, which inhibits the action of sulfonamides and is a known allergen. In patients with a known allergy to an ester anesthetic, the use of all other ester-type anesthetic agents should be avoided. Amide-type local anesthetics (see Table below) are metabolized by microsomal enzymes located in the liver. The specific microsomal enzyme responsible for the elimination of lidocaine is cytochrome P-450 3A4. Therefore, amide-type anesthetics should be used with care in patients with severe liver disease and patients taking medications that interfere with the metabolism of the anesthetic, and the patients should be carefully monitored for signs of toxicity. Cytochrome P-4503A4 is present in the small bowel and the liver. Commonly used medications known to inhibit cytochrome P-4503A4 are listed below (adapted from Klein and Kassarjdian). Specific potent inhibitors of cytochrome P-4503A4 that have been associated with clinically relevant interactions include itraconazole, ketoconazole (azole antifungals), erythromycin, clarithromycin, cyclosporin (macrolides), amprenavir, indinavir, nelfinavir, ritonavir (HIV protease inhibitors), diltiazem, mibefradil (calcium channel blockers), and nefazodone. Grapefruit juice is also a potent inhibitor of P-4503A4 but appears to affect only the enteric enzyme, which does not play a role in the metabolism of local anesthetics. If the enzyme is inhibited because of the concurrent use of medications, it is unavailable to metabolize the anesthetic and potentially toxic levels of the anesthetic can occur. In addition, beta-blockers may decrease blood flow to the liver; therefore, they may also decrease the metabolism of amide-type anesthetics and may cause serum levels of the anesthetic to increase. Local effects are usually a result of the injection technique. These effects include pain, ecchymosis, hematoma formation, infection, and nerve laceration. Pain is always felt when a local anesthetic is injected; however, associated discomfort can be minimized by using good technique. Several factors, including needle puncture of the skin, tissue irritation resulting from the anesthetic, and distention of tissues caused by infiltration, are responsible for the discomfort associated with the use of local anesthetics. Pediatric patients and patients who are extremely anxious may benefit from pretreatment of the injection area with a topical anesthetic. Pretreatment eliminates the initial pain that occurs when the needle perforates the skin. Small-diameter needles also decrease the pain associated with injection. Fortunately, for most dermatologic procedures, a 30-gauge needle can be used to infiltrate tissue. Tissue irritation caused by local anesthetics is related to the acidity of the infiltrated solution; therefore, increasing the pH of the mixture can decrease associated discomfort. The addition of epinephrine to an anesthetic solution decreases the pH of the solution, making it more acidic (pH 3.5-4.5) and leading to a more painful injection. The solution can be neutralized by the addition of sodium bicarbonate 8.4% to minimize discomfort. For example, sodium bicarbonate 8.4% can be added to lidocaine with epinephrine in a 1:10 ratio to achieve a solution pH similar to that of tissue fluid (pH 7.3-7.4). Discomfort associated with distension of the tissues during the injection of local anesthetics is caused by the rate of injection and the volume of fluid injected. To limit the pain, the anesthetic should be slowly administered to allow the stretch receptors time to accommodate the new volume of fluid. In addition, the volume of solution injected should be the smallest volume needed to achieve a loss of sensation at the surgical site. The formation of ecchymosis or a local hematoma is a result of the perforation of cutaneous blood vessels. These complications are encountered more commonly in areas of high vascularity, including the mucous membranes, head, and genitalia. Ecchymosis and hematoma are even more pronounced when the patient has a bleeding diathesis or when the patient has been taking aspirin or other anticoagulants. If ecchymosis occurs, the patient should simply be reassured. If hematoma formation occurs, the patient should be evaluated. The hematoma may require drainage with an 18-gauge needle, followed by the application of a pressure dressing. Infection is an additional local complication of anesthetic use that usually occurs when proper sterile technique is not used. Cleansing the skin surface with alcohol is adequate in otherwise clean or noninfected areas. If signs of infection are noted, treatment includes appropriate culture studies and antimicrobial therapy. If abscess formation occurs, drainage may also be required. Nerve laceration, although rare, may occur during the infiltration of a local anesthetic. This complication more commonly occurs during the placement of regional blocks than the placement of other blocks. Clinical indications of nerve laceration include paresthesias, shooting or sharp stinging sensations, and excessive pain during needle insertion. Paresthesias of the infraorbital nerve are characterized by sharp or shooting sensations involving the upper lip, nasal ala, and upper teeth. If the needle is suspected to have entered or lacerated a nerve, it should be withdrawn slowly and deliberately by 1-2 mm, until the paresthesias are no longer present. The needle should never be advanced further, moved laterally, or inserted into the foramen, because these maneuvers further increase the risk of nerve laceration. Although dysesthesias may remain for an extended duration, in most patients, the nerve regenerates and sensation normalizes over time. Tendon injury is an inherent aspect of transthecal digital anesthesia since the needle is pushed through the tendon. This may cause persistent discomfort lasting 1-2 days post surgery. Tendon sheath infection and late occurrence of trigger finger have also been reported. Amethocaine may induce an urticarial reaction at the site of application, and the risk of such a reaction seems to be significantly higher when amethocaine is used over the antecubital fossa and in younger children. Systemic effects usually occur when blood concentrations of local anesthetic increase to toxic levels. Effects are most often encountered after the unintentional intravenous injection or administration of an excessive dose of an anesthetic. Adding a vasoconstrictor (eg, epinephrine) can reduce the systemic absorption of an anesthetic. When using topical anesthetics, strict adherence to the maximal dose or area recommended is advised; additionally, great caution must be exercised when using topical anesthetics on mucosal surfaces because of the much greater absorption. Importantly, remember that (1) the metabolism of ester anesthetics is decreased in patients with deficient pseudocholinesterase activity and (2) the metabolism of amide anesthetics in patients who are taking medications that inhibit the cytochrome P-450 system is decreased. In addition, the potency of an anesthetic is directly correlated with the potential for toxicity. Allergic reactions, although systemic, are not related to serum levels of the anesthetic, but rather, they are considered idiosyncratic and can occur at any dose. Maximal safe doses of lidocaine for local anesthesia have been determined. For adults, a maximum of 4.5 mg of lidocaine per kilogram of body weight can be administered, whereas as much as 7 mg/kg can be used if the lidocaine solution has 1:100,000 epinephrine added as a vasoconstrictor. For children, lower maximal doses are recommended; only 1.5-2.5 mg/kg of plain lidocaine and 3-4 mg/kg of lidocaine with epinephrine should be used. Systemic toxicity resulting from excessive blood levels of anesthetics is clinically manifested as adverse reactions in the CNS and cardiovascular system. The CNS is affected in a predictable and dose-dependent fashion. As serum levels of lidocaine increase, effects on the CNS become more severe. Any physician who uses local anesthetics must be aware of the signs and symptoms of systemic toxicity. At serum lidocaine levels in the range of 1-5 mcg/mL, patients may complain of tinnitus, lightheadedness, circumoral numbness, diplopia, or a metallic taste in the mouth. In addition, they may complain of nausea and/or vomiting, or they may become more talkative. As serum levels increase to 5-8 mcg/mL, nystagmus, slurred speech, localized muscle twitching, or fine tremors may be noticed. Patients also have been noted to have hallucinations at these levels. If blood lidocaine levels reach 8-12 mcg/mL, focal seizure activity occurs; this can progress to generalized tonic-clonic seizures. Respiratory depression occurs at extremely high blood levels (20-25 mcg/mL) and can progress to coma. If signs of CNS toxicity are noted, steps must be taken to reduce hypoxia and acidosis, because these states increase the toxicity of local anesthetics. The patient's airway should be maintained, and supplemental oxygen provided. If blood levels of carbon dioxide increase, protein binding of lidocaine decreases and results in higher levels of free lidocaine in the blood. Increased respiration and respiratory alkalosis increase the seizure threshold and decrease the uptake of the local anesthetic into the CNS. If convulsions occur, the patient's airway should be maintained, and supplemental oxygen administered. If seizure activity is sustained, 5-10 mg of diazepam should be administered slowly (1-2 mg/min) until the seizures cease. Compared with the CNS, the cardiovascular system is less susceptible to the effects of local anesthetics. Most adverse effects of the cardiovascular system that occur with the administration of local anesthetics are a result of the addition of epinephrine rather than direct effects of the anesthetic. However, high blood levels of local anesthetics directly reduce cardiac contractility. In addition to the direct vasodilatory effects of most local anesthetics, the decrease in cardiac function can cause hypotension. Atrioventricular blocks, bradycardia, and ventricular arrhythmias also are reported; these are more common in patients with known conduction disturbances and requiring antiarrhythmic medications. The treatment of conduction disturbances should be appropriately tailored to the type of reaction. The treatment of hypotension requires the physician to initiate advanced cardiac life support protocols, that is, he or she should ensure that the patient has a patent airway, provide supplemental oxygen, and elevate the patient's legs. If necessary, intravenous fluid should be administered, and the use of vasopressor agents such as ephedrine should be considered. Ephedrine can be intravenously administered in 5-mL incremental doses to a total of 15-30 mg, until a blood pressure response is noted. Lidocaine and the FDA-approved topical anesthetics EMLA and LMX are pregnancy category B medications. Allergic reactions to local anesthetics are extremely rare, especially with amide local anesthetics, and account for less than 1% of the reactions caused by local anesthetics. Reactions can be type 1 (ie, anaphylactic) or type 4 (ie, delayed-type hypersensitivity) reactions. These reactions are not dose related, but, rather, they are idiosyncratic. Skin prick and intradermal test results are negative in the vast majority of patients, but some authors recommend testing with the most commonly used amide local anesthetic (lidocaine). Type 1 reactions are usually caused by ester-type anesthetics. The ester group of local anesthetics have a much greater allergenic potential than that of the amide group. Pseudocholinesterases, which produce the highly allergenic metabolic product PABA, break down ester-type anesthetics. Cross-reactivity exists among ester anesthetics; therefore, the use of all anesthetics in this structural group should be avoided in a patient with an established sensitivity to one ester-type anesthetic. No cross-reactivity appears to exist between ester and amide anesthetics; however, cross-reactivity in anaphylactic reactions has not been investigated thoroughly. In addition, reactions to preservatives, specifically methylparaben and sodium metabisulfate (found in multiple-dose vials of amide anesthetics), may cause adverse reactions in a patient who is allergic to an ester-type anesthetic. Preservative-free single-dose vials of lidocaine are available for use if an amide anesthetic is to be used in a patient with a true hypersensitivity reaction to ester-type anesthetics. Clinical signs of type I reactions include pruritus, urticaria, facial swelling, wheezing, dyspnea, cyanosis, laryngeal edema, nausea, vomiting, and abdominal cramping. Epinephrine with a concentration of 1:1000 should be subcutaneously administered at a dose of 0.3-0.5 mL. This dose can be repeated every 20-30 minutes to a maximum of 3 doses. If anaphylaxis ensues, a 5-mL dose of epinephrine 1:10,000 should be administered intravenously. Type IV (ie, delayed-type hypersensitivity) reactions account for 80% of allergic reactions to local anesthetics. They are more common with the use of topical anesthetics and may occur with anesthetics of the amide and ester subtypes. Clinical manifestations are similar to those of allergic contact dermatitis and include erythema, plaques, and pruritus. Patients with a history of type IV reactions are not at an increased risk of type I reactions due to amide-type anesthetics. Contact dermatitis caused by topical anesthetics should be treated with topical steroid preparations. Alternative agents for use as anesthetics in patients with a known allergy to both ester- and amide-type local anesthetics include isotonic sodium chloride solution and injectable antihistamines. An intradermal injection of 0.9% sodium chloride solution can provide temporary anesthesia suitable for shave or punch biopsy. Physical pressure on the nerve endings resulting from the volume injected is postulated to be responsible for the anesthetic effect. Nonbacteriostatic sodium chloride solution should be used if the patient has an allergy to the methylparaben preservative in the local anesthetic. A bacteriostatic solution, which contains benzyl alcohol, has known anesthetic properties and can be used for limited procedures such as punch biopsy. Injectable antihistamines, such as diphenhydramine, have been administered to patients who are allergic to local anesthetics. The mechanism of anesthetic action is unknown. Injectable diphenhydramine is effective, but it has a short duration of activity, it is sedating, and its injection is painful. In addition, tissue necrosis is reported after the local injection of 5% diphenhydramine. If used for injection, diphenhydramine should be diluted to 1% by mixing 1 vial of 50-mg diphenhydramine with 4 mL of a bacteriostatic sodium chloride solution. With the exception of cocaine, local anesthetics directly cause relaxation of the vascular smooth muscle, which leads to vasodilation. This effect increases bleeding at the surgical site. Vasoconstrictors, such as epinephrine, are often added to anesthetic solutions to counteract this effect. The vasoconstrictor effect of epinephrine is maximal at 7-15 minutes, and this effect is clinically evident as blanching of the skin. This blanching also is useful in determining the area that is anesthetized. Vasoconstriction not only decreases bleeding but also slows the rate of systemic absorption of the anesthetic, which allows the body more time to metabolize the anesthetic and prolongs anesthesia. Therefore, larger volumes of anesthetic can be injected when epinephrine is added to a solution. A premixed solution of lidocaine with epinephrine in a concentration of 1:100,000 (1 mg/100 mL) is available. Concentrations greater than this are associated with a higher rate of adverse effects, including an increased risk of tissue necrosis as a result of prolonged ischemia. Systemic effects of epinephrine can occur with a dose as little as 2 mL of an anesthetic solution containing epinephrine in a concentration of 1:100,000. The most common clinical manifestation is transient tachycardia. At higher doses and with an inadvertent intravascular injection, palpitations, diaphoresis, angina, tremors, nervousness, and hypertension can occur. The maximum dose of epinephrine is 1 mg or 100 mL of a 1:100,000 solution. In patients with a history of heart disease, especially unstable angina and arrhythmias, the maximum dose should be decreased to 0.2 mg or 20 mL of a 1:100,000 solution (recommendation of the NY Heart Association). Epinephrine is contraindicated in patients with pheochromocytoma, hyperthyroidism, severe hypertension, or severe peripheral vascular occlusive disease. Relative contraindications include pregnancy and psychological instability; epinephrine can induce an acute psychotic episode in predisposed patients. The FDA designates epinephrine as a pregnancy category B medication (ie, usually safe but benefits must outweigh the risks). No known adverse effects on the fetus are reported; however, during the first trimester, vasoconstriction may cause fetoplacental ischemia and affect organogenesis. In the last trimester, epinephrine can induce premature labor if placental ischemia occurs. If possible, surgery should be performed without epinephrine, or it should be postponed until after delivery. Epinephrine must be used with caution in patients taking propranolol because life-threatening reactions have been reported; these include hypertension, myocardial infarction, and stroke. Epinephrine stimulates alpha-receptors to cause vasoconstriction and increase vascular resistance. Beta-receptors balance this effect by causing vasodilation (beta2-receptors) and an increased heart rate (beta1-receptors). Like other nonselective beta-blockers, propranolol antagonizes both beta1-receptors and beta2-receptors. Therefore, in the presence of propranolol, the effects of epinephrine on alpha-receptors are unbalanced, and the result is pure alpha stimulation, which leads to severe hypertension and reflex bradycardia. Although propranolol is the only nonselective beta-blocker reported to have this effect, probably all nonselective beta-blockers have the potential to cause severe hypertension and reflex bradycardia in the presence of epinephrine. A significant risk does not appear to be associated with the use of epinephrine and cardioselective beta-blockers. Although the use of epinephrine in patients who are taking nonselective beta-blockers is not contraindicated, it should be avoided if possible. Apparently, the effect may be dose related, and caution should be exercised because individual variability is reported. In addition to nonselective beta-blockers, monoamine oxidase inhibitors, tricyclic antidepressants, butyrophenones, and phenothiazines can cause hypotension or hypertension in patients who are taking epinephrine. Pain resulting from the infiltration of a local anesthetic can be reduced by using a solution with a pH close to physiologic range (ie, pH 7.3-7.4). The pH of plain lidocaine is 6.3-6.4. When epinephrine is added to lidocaine, the pH decreases to 3.5-4.5. The pH of the solution must be acidic to prevent the degradation of epinephrine. To reduce the pain of an injection of lidocaine and epinephrine, 1 mL of sodium bicarbonate 8.4% is added to 10 mL of the anesthetic solution to neutralize the solution. Buffered solutions should be discarded after 1 week because the effectiveness of epinephrine decreases by almost 25% during this time. Hyaluronidase is a bovine-derived enzyme that hydrolyzes hyaluronic acid in the connective tissue and facilitates the diffusion of the anesthetic. Although it can increase the spread of anesthesia, hyaluronidase also decreases the duration of action of the anesthetics because it increases absorption. As expected, this increased absorption leads to the potential for a greater incidence of toxic reactions that correspond to elevated blood levels. To decrease distortion of the surgical site, the addition of hyaluronidase is useful for nerve blocks and procedures around the orbit. Hyaluronidase is marketed in ampules. One ampule is equivalent to 150 United States Pharmacopeia (USP) units per milliliter. The usual dilution is 150 U in 30 mL of anesthetic. A patient can have an allergy to hyaluronidase. Hyaluronidase is a foreign protein, and its use is contraindicated in patients with a known allergy to bee stings. In addition, hyaluronidase contains the preservative thimerosal, which is a known allergen. To evaluate the potential for an allergic reaction before infiltration, a test dose should be injected intradermally. If urticaria is observed at the site of the test injection, the use of hyaluronidase is contraindicated. In 1987, Jeffery Klein, a dermatologist, first created the technique of tumescent anesthesia in liposuction procedures. Tumescent anesthesia is based on the use of dilute solutions of lidocaine (0.05-0.1%) in large volumes to provide superior anesthesia. Epinephrine (1:1,000,000) is added for hemostasis, and the solution is buffered with sodium bicarbonate to decrease injection discomfort. Concentrations as high as 55 mg/kg have been used safely with the tumescent technique. The use of such high total doses of anesthetic without systemic toxicity is understood. The absorption kinetics of lidocaine change when high-volume, low-concentration solutions are used. Decreased concentrations of lidocaine also result in slower plasma absorption with decreased peak plasma levels. The development of this anesthetic delivery system has revolutionized the surgical technique of liposuction. Klein JA, Kassarjdian N. Lidocaine toxicity with tumescent liposuction. A case report of probable drug interactions. Dermatol Surg. 1997 Dec. 23(12):1169-74. [Medline]. Dinehart SM. Topical, local and regional anesthesia. Wheeland RG, ed. Cutaneous Surgery. Philadelphia: WB Saunders; 1994. 103. Mossetti V, Vicchio N, Ivani G. Local anesthetis and adjuvants in pediatric regional anesthesia. Curr Drug Targets. 2012 Jun. 13(7):952-60. [Medline]. Auletta M, Grekin R. Local Anesthesia for Dermatologic Surgery. New York: Churchill Livingstone; 1991. Hogan ME, Vandervaart S, Perampaladas K, Machado M, Einarson TR, Taddio A. Systematic Review and Meta-analysis of the Effect of Warming Local Anesthetics on Injection Pain. Ann Emerg Med. 2011 Jul. 58(1):86-98.e1. [Medline]. Fuzier R, Lapeyre-Mestre M, Mertes PM, et al. Immediate- and delayed-type allergic reactions to amide local anesthetics: clinical features and skin testing. Pharmacoepidemiol Drug Saf. 2009 Jul. 18(7):595-601. [Medline]. Neal JM, Mulroy MF, Weinberg GL. American Society of Regional Anesthesia and Pain Medicine checklist for managing local anesthetic systemic toxicity: 2012 version. Reg Anesth Pain Med. 2012 Jan-Feb. 37(1):16-8. [Medline]. Berkun Y, Ben-Zvi A, Levy Y, Galili D, Shalit M. Evaluation of adverse reactions to local anesthetics: experience with 236 patients. Ann Allergy Asthma Immunol. 2003 Oct. 91(4):342-5. [Medline]. Brutus JP, Baeten Y, Chahidi N, Kinnen L, Ledoux P, Moermans JP. Single injection digital block: comparison between three techniques. Chir Main. 2002 May. 21(3):182-7. [Medline]. Chen JZ, Alexiades-Armenakas MR, Bernstein LJ, Jacobson LG, Friedman PM, Geronemus RG. Two randomized, double-blind, placebo-controlled studies evaluating the S-Caine Peel for induction of local anesthesia before long-pulsed Nd:YAG laser therapy for leg veins. Dermatol Surg. 2003 Oct. 29(10):1012-8. [Medline]. Chen JZ, Jacobson LG, Bakus AD, et al. Evaluation of the S-Caine Peel for induction of local anesthesia for laser-assisted tattoo removal: randomized, double-blind, placebo-controlled, multicenter study. Dermatol Surg. 2005 Mar. 31(3):281-6. [Medline]. Covino BG. Local anesthesia. 1. N Engl J Med. 1972 May 4. 286(18):975-83. [Medline]. Doshi SN, Friedman PM, Marquez DK, Goldberg LH. Thirty-minute application of the S-Caine peel prior to nonablative laser treatment. Dermatol Surg. 2003 Oct. 29(10):1008-11. [Medline]. Dresser GK, Spence JD, Bailey DG. Pharmacokinetic-pharmacodynamic consequences and clinical relevance of cytochrome P450 3A4 inhibition. Clin Pharmacokinet. 2000 Jan. 38(1):41-57. [Medline]. Eichenfield LF, Funk A, Fallon-Friedlander S, Cunningham BB. A clinical study to evaluate the efficacy of ELA-Max (4% liposomal lidocaine) as compared with eutectic mixture of local anesthetics cream for pain reduction of venipuncture in children. Pediatrics. 2002 Jun. 109(6):1093-9. [Medline]. Friedman PM, Mafong EA, Friedman ES, Geronemus RG. Topical anesthetics update: EMLA and beyond. Dermatol Surg. 2001 Dec. 27(12):1019-26. [Medline]. Goldman RD. ELA-max: A new topical lidocaine formulation. Ann Pharmacother. 2004 May. 38(5):892-4. [Medline]. Grekin RC, Auletta MJ. Local anesthesia in dermatologic surgery. J Am Acad Dermatol. 1988 Oct. 19(4):599-614. [Medline]. Huang W, Vidimos A. Topical anesthetics in dermatology. J Am Acad Dermatol. 2000 Aug. 43(2 Pt 1):286-98. [Medline]. Hung VS, Bodavula VK, Dubin NH. Digital anaesthesia: comparison of the efficacy and pain associated with three digital nerve block techniques. J Hand Surg Br. 2005 Dec. 30(6):581-4. [Medline]. Jih MH, Friedman PM, Sadick N, Marquez DK, Kimyai-Asadi A, Goldberg LH. 60-minute application of S-Caine Peel prior to 1,064 nm long-pulsed Nd:YAG laser treatment of leg veins. Lasers Surg Med. 2004. 34(5):446-50. [Medline]. Kindler CH, Yost CS. Two-pore domain potassium channels: new sites of local anesthetic action and toxicity. Reg Anesth Pain Med. 2005 May-Jun. 30(3):260-74. [Medline]. Langan SM, Collins P. Randomized, double-blind, placebo-controlled prospective study of the efficacy of topical anaesthesia with a eutetic mixture of lignocaine 2.5% and prilocaine 2.5% for topical 5-aminolaevulinic acid-photodynamic therapy for extensive scalp actinic keratoses. Br J Dermatol. 2006 Jan. 154(1):146-9. [Medline]. Laskin DM. Diagnosis and treatment of complications associated with local anaesthesia. Int Dent J. 1984 Dec. 34(4):232-7. [Medline]. Lillis PJ. The tumescent technique for liposuction surgery. Dermatol Clin. 1990 Jul. 8(3):439-50. [Medline]. McCaughey W. Adverse effects of local anaesthetics. Drug Saf. 1992 May-Jun. 7(3):178-89. [Medline]. Moore DC, Bridenbaugh LD, Thompson GE, Balfour RI, Horton WG. Factors determining dosages of amide-type local anesthetic drugs. Anesthesiology. 1977 Sep. 47(3):263-8. [Medline]. O'Brien L, Taddio A, Lyszkiewicz DA, Koren G. A critical review of the topical local anesthetic amethocaine (Ametop) for pediatric pain. Paediatr Drugs. 2005. 7(1):41-54. [Medline]. Proudfoot C, Gamble C. Site-specific skin reactions to amethocaine. Paediatr Nurs. 2006 Jun. 18(5):26-8. [Medline]. Scher RK, Daniel CR, eds. Nails. Therapy, Diagnosis, Surgery. Philadelphia: WB Saunders; 1997. Scholz A. Mechanisms of (local) anaesthetics on voltage-gated sodium and other ion channels. Br J Anaesth. 2002 Jul. 89(1):52-61. [Medline]. Singer AJ, Stark MJ. LET versus EMLA for pretreating lacerations: a randomized trial. Acad Emerg Med. 2001 Mar. 8(3):223-30. [Medline]. Skidmore RA, Patterson JD, Tomsick RS. Local anesthetics. Dermatol Surg. 1996 Jun. 22(6):511-22; quiz 523-4. [Medline]. Touma S, Jackson JB. Lidocaine and prilocaine toxicity in a patient receiving treatment for mollusca contagiosa. J Am Acad Dermatol. 2001 Feb. 44(2 Suppl):399-400. [Medline]. Waton J, Boulanger A, Trechot PH, Schmutz JL, Barbaud A. Contact urticaria from Emla cream. Contact Dermatitis. 2004 Nov-Dec. 51(5-6):284-7. [Medline]. Wildsmith JA, Strichartz GR. Local anaesthetic drugs--an historical perspective. Br J Anaesth. 1984 Sep. 56(9):937-9. [Medline]. Yin ZG, Zhang JB, Kan SL, Wang P. A comparison of traditional digital blocks and single subcutaneous palmar injection blocks at the base of the finger and a meta-analysis of the digital block trials. J Hand Surg Br. 2006 Oct. 31(5):547-55. [Medline]. Zempsky WT, Parkinson TM. Lidocaine iontophoresis for local anesthesia before shave biopsy. Dermatol Surg. 2003 Jun. 29(6):627-30. [Medline].